Our eBook Will Teach You How To Get Back On Google Again! So What Happens When You Get Suspended from Google (Adsense/Adwords)? Did you click on your own ads? More than half of the people who have been suspended, this is their reason. Other reasons include violations, illegal tactics, linking your account with a suspended one, having your account hijacked, or our personal favorite, having some random jerk-off click on your ads in hopes of Google thinking it's you. Not only will Google freeze or close your current account, but they will store and track all of your computer information. This includes your IP address, cookies, and flash objects. Not only will they track these things on your computer, but they will also store your name, credit card number, bank account number, email address, physical address, phone number, and any other information you may have given to Google. Our guide will help you get a FRESH, NEW ACCOUNT, and be anonymous to Google! We discovered all the tactics and tricks needed to fool Google, the LEGAL way! So, if you have a suspended ADSENSE or ADWORDS Google Account, make sure to stop worrying about it, and purchase this guide now! - Any questions? Please email us. - 100% Satisfaction Guaranteed or MONEY BACK! If you have tried to get back on Google and constantly get blocked and linked to your old account, then this guide is for you! We GUARANTEE we will get you back on Google and selling again, with no risk of getting caught ever again! Be completely anonymous and remain a seller on one of internet's most visited retail sites! If you do decide to pass up on this ebook, please understand you WILL GET LINKED by Google. They have advanced techniques which surpass any other company in linking accounts. This includes eBay as well. Don't expect to be able to get on Google the same way you get back on ebay. Here comes the best news: Our methods of getting back on Google is 100% LEGAL and SAFE! Yes, by following our steps you will not be breaking any laws or even Google's Policy Statement. We have designed our methods specifically for those looking to get back on Google and have not been successful because they either get linked again or get blocked by Google over and over again with no help! Now there is help and don't miss out this opportunity! GoogleStealth is a ebook designed to get you back on Google selling safely and securley. No more account closures or blocking of your Google account. The ebook will also teach you how to create multiple Google accounts, run them all successfully, and profit on Google the safe and fast way! Ofcourse, it is easy to create a brand new Google account, however, they will get traced by Google and easily be closed down in just a manner of days. Our eBook outlines the STEP-BY-STEP GUIDELINES for getting back on Google. 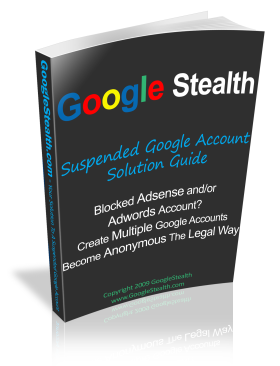 If you just got suspended or blocked from Google selling indefinitly, then this eBook is A MUST HAVE! Google Updates Automatic updates to our eBook when available. This means that you will get a new version of guide whenever there is an update! Be Fully Anonymous You will learn how to completely hide from Google's prying eyes and keep your identity anonymous. Get Back To Selling You will learn how to safely register a new Google account without them ever knowing it is you! Link Your Bank Account Safely We will show you how to link your bank account securely without revealing your name with Google. How To Minimize Limations and Length Of Them Every Google seller gets limited and we have tips on how to limit them and shorten thier lengths. Create Multiple Accounts Safely Learn how to create multiple Google accounts the right way, without linking. Added Protection We give you tips and techniques you can use to stay away from Google Technical team - lowering your chances of ending up with another closed account. Avoid Linking Accounts We show you to avoid Google finding out you have multiple selling accounts! 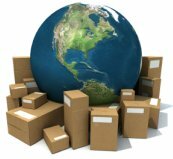 Suppliers And Wholesale List We show you how to successfully drop ship items and make thousands of dollars a month easily with Google. If your account got suspended and Google gave you the email where they state you have violated thier user terms and conditions, and therefore, are not allowed to sell on Google ever again, then GoogleStealth is a MUST HAVE! We teach you exactly how to get past this and start selling again! This book is just excellent. They teach you exactly what I needed to know about getting back on Adwords and Adsense. I've spent hours upon hours trying to find out how to get back on my Google account through searches and forums with no help at all. For a small cost, they saved me time and money! Need help getting back on Adsense but don't know how to do it? Look no further, the solution is right here. Its amazing how they do it, and certainly a must read for anyone trying to avoid Google limitations and account closures for good!!! The best and ONLY one out there! I've spent countless of hours searching for something like this, and finally have found it. Don't miss out on this opportunity to get back on Adsense and Adwords! Cya all back on Google!! Want your feedback posted on this wall and a link to your site? Simply email us your testimonial to get started! We decided to create a Google ebook as we saw the increasing of Google sellers getting suspended everyday. Users are getting desperate to create new accounts to start making money again. The increase of Google expectations and stricter policy's and rules has also been a huge factor in the writing of GoogleStealth. Imagine your business being completely on Google and then become closed? What would you do? With this eBook you will learn how to start it all up again safley and securly once again! We know that our guide is not the only possible solution to creating an Amazson account, but it is the only sure shot way of getting back on without getting linked! Our guide is the ONLY guide out there that has everything you need to know to start selling on Google ALL IN ONE easy to read PDF format ebook. Purchase our eBook right now, and you will also get"
Complete list of wholesalers, liquidation auctions, drop shippers, retail websites, and much more to help you decide what to sell and how much inventory you can handle. List of our partners who are giving you special discounts on business specific services. Payment processors, domain registrations, website hosting, and much, much more! Our website has interactive forums, business blogs, customer service, and more all at your fingertips! Buy the ebook and automatically become a VIP member to our online stealth community as a bonus! Join our exclusive stealth community today! Sign me up! I’m ready to start selling on Google again! I want to stop wondering what to do next and get started now! Click the button below to get GoogleStealth Now! Yes! I Want To Create A Stealth Google Account Today! P.S. We truly believe we have created something priceless for you. This eBook is designed to help you create your own business with ease, and it certainly does achieve that. Don't waste time searching through the web and forums looking for a way to do what this eBook tells you. You will just be digging yourself in a deeper hole, with less money to afford our eBook!